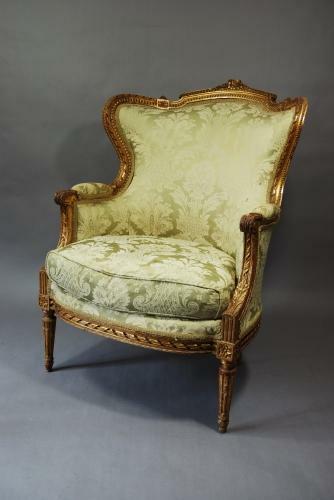 A very decorative French 19thc gilt & carved wooden upholstered armchair. The gilt wood frame consists of various carved decoration, the top rail having a central carving of flowers. The arm consists of a scroll leaf carving flowing down to a reeded & carved arm support. The legs are turned & reeded. The front legs have had repairs in the past.